Congratulations you have now taken the first step into an amazing world that will captivate and excite you. We will guide you through all of the elements of the course and ensure that you are completely happy, have achieved mastery of all of the knowledge, skills and etiquette that you need to be a certified PADI Scuba Diver with Stellar Divers, of course not forgetting, we will ensure that you have fun along the journey. We are excited and looking forward to sharing our knowledge, love of scuba diving and showing you what the oceans have to offer you. If you are one of our LSST Priory Students please click here otherwise please read on. The Induction Event: We run this event on a Sunday at 10:30 or a Tuesday at 18:00 at our office at 4 Stirlin Court, Saxilby Enterprise Park, Saxilby, Lincoln LN1 2LR If you haven’t already attended your induction please contact us (use the contact button below) and we can schedule your event. Once at the event you will then have the opportunity to meet the Dive Team, ask us questions and become aquatinted with the content of the course. We will discuss timings, complete some straight forward course paperwork and give you your PADI Ultimate crew pack. Knowledge Development: In the PADI Ultimate crew pack you have 2 DVD’s, a PADI Manual & Recreational Dive Planner (RDP) with associated instructions, please read your PADI manual/watch the dvds and complete up to the end of chapter 3 answering all of the questions in the knowledge reviews at the end of each chapter. Please be careful with the questions they may on occasion seem ambiguous, this is not to catch you out, it is designed to make you think. Once you have read to the end of chapter 3 please let us know by contacting us via email or call us at the Lincoln office and we will schedule a classroom session to bring you in, check your answers, test your knowledge with some quizzes, answer any questions that you have and fill any knowledge gaps that there may be. Once we have done that we will then introduce you to the RDP (that blue & white table thingamigig in your pack) and explain the background of it, the reason we use it and how to plan dives etc with it. This session will last around 1 1/2 hours. Pool Sessions: This course is very much a blend of knowledge development and pool work, we normally expect you to finish to the end of Chapter 3 before we start your pool sessions, this is simply because you will understand what we are going to show you before you get in the water. 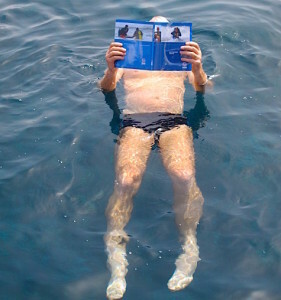 The diving is the fun part, the knowledge section supports this so we combine the two. We normally schedule the pool sessions on or before the first classroom session and look at any unique needs that you have. 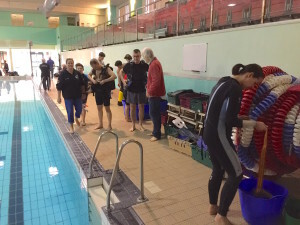 The pool skills development is split into 3 separate yet interconnected sessions which are spread over three 2 hour pool sessions at Yarborough Leisure Centre in Lincoln, LN1 3SP on a Sunday morning. We will teach you a combination of scuba and skin diving skills, each skill and set of skills will be briefed for you then one of our highly qualified instructors will demonstrate exactly what we want you to do. You will then get plenty of time to practice the skill or set of skills until you and we are happy before moving on to the next. There will be plenty of time to put the skills into practice as we always finish the sessions with a dive around the pool to help you consolidate the skills and have some fun. Once you have finished your pool sessions it is then time to go to Open Water. Open Water: This is where it gets really exciting; if you are finishing the course with us in the UK we will take you to either; Girton, Blue Lagoon, Stoney CoveCapernwray. 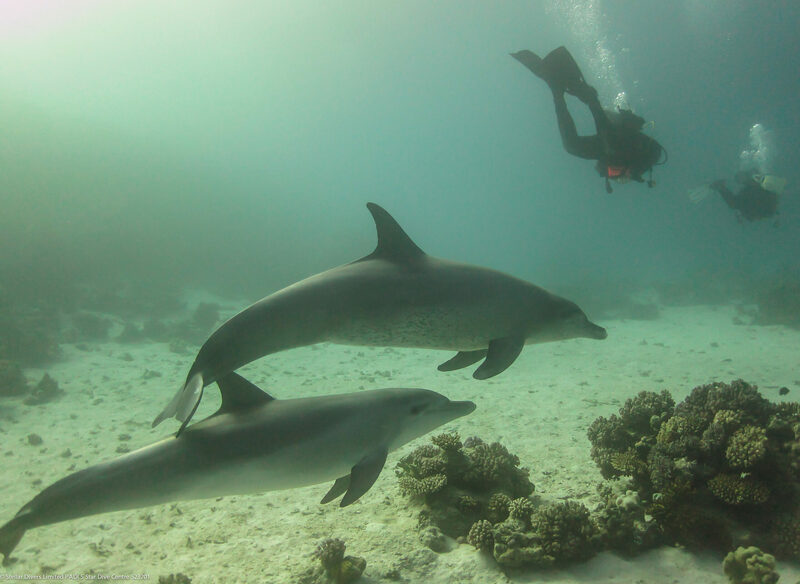 If you have chosen a PADI Scuba Diver Referral you will finish this section at your holiday/travel destination (please seek out a PADI 5 Star IDC Dive Centre like us). 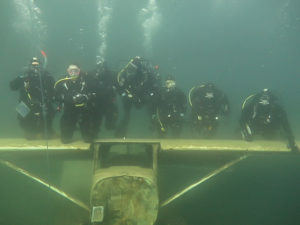 Over the day (either weekend or weekday depending on your flexibility) we will complete two dives, the dives will allow you to expand your skills into the Open Water environment and the best bit, you will actually dive with fish life, see some fantastic wrecks and start to see how amazing diving really is. At Capernwray for instance there are many interesting things to see; a helicopter, sunken boats, submarine and some great fish life. Incidentally the “interesting” things have been deliberately sunk for your pleasure 🙂 Once you finish the last dive and have visited 12m you will then be a fully certified PADI Scuba Diver with all of the prestige and opportunities that it brings. Log Book: The log book in your crewpack is for both you & us to keep a record of your achievements as we move through the course so that there is a permanent record for you to keep. Please make sure you bring it with you to every session that we do with you so we can sign each and every stage off. You will be asked for proof of this by dive centres around the world when you go on your travels. Please keep it updated with all of your future dives, it is something to be very proud of and it’s great to look back on. Course fees: We will take a £75 deposit from you when you sign up. We do not expect you to pay anything else until you have finished the pool sessions when we will ask you for the next payment of £100. Once you finish your Open Water dives we will require the outstanding balance so we can get you registered and certified with PADI. If you are on one of our prestigious bundles such as Open Water UK or Holiday edition we will conclude all of the additional specialist training before the final balance is payable. You can of course choose a different payment plan to suit you, just let us know your thoughts. The only additional expenses you will incur are then entry fees into Girton (currently £10), Blue Lagoon (currently £15), Capernwray (currently £17) or Stoney Cove (currently £22) there is a £25 one off registration fee as well at Capernwray that will give you a lifetime membership. Help: Is at hand, if while you are going through your course you encounter a question or need assistance then just let us know. Drop us an email or call the office…we love to chat. Please, please feel free to ask as many questions as you wish, you are doing something completely new and exciting, it is normal that you have questions. We certainly all did when we started diving so please never feel that you can’t or perhaps shouldn’t ask. Where: To recap, all of your pool sessions will be at Yarborough Leisure Centre, Riseholme Road, Lincoln, LN1 3SP 07:30 -09:30 on a Sunday morning. Please bring swim wear, shower “stuff” and your log book. When you arrive go through reception, get changed into swim kit & a tee shirt then meet us on pool side. Classroom sessions are on Sunday at 10:30 or a Tuesday at 18:00 at our office at 4 Stirlin Court, Saxilby Enterprise Park, Saxilby, Lincoln LN1 2LR , it is VITAL that you bring your PADI manual, RDP & log book. So what now: Once you certify as an Scuba Diver the world is yours to dive. You will have learnt an abundance of skills and seen some amazing things so why stop there? Why not take the next step and become a PADI Open Water diver, adding extra skills, experience and depth to your certification, PLUS you will be able to dive without a PADI Pro present. You can then go one even further. 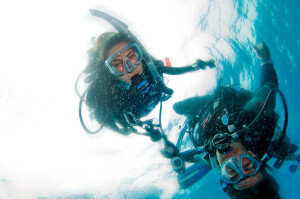 Don’t stop, learn how to apply those skills to real diving situations? 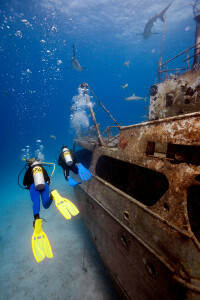 Let us teach you how to expertly navigate to and properly dive on wrecks, how to enhance you buoyancy skills, how to dive to 30 meters and perhaps take pictures of the amazing things you see! Interested? Then the PADI Advanced Open Water & PADI Advance Open Water Plus is just what you want. Most of our Open Water divers make the natural step to Advanced Open Water level and become much better divers who have much more fun in the process. Please have a look at these fantastic courses and enrol to take the next exciting step, you can do all of the theory without even visiting the classroom, just visit our eLearning hub and see how. Stellar Divers: As a qualified diver you will be eligible to come with us on our many trips both UK & abroad and enjoy our social events. 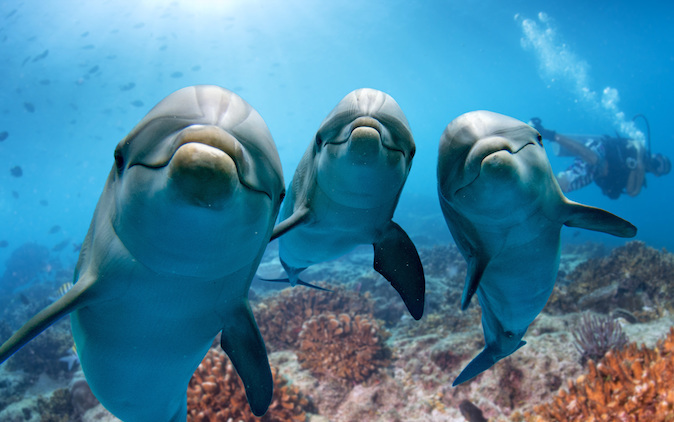 We want you to stay part of Stellar Divers and enjoy diving as much as we do. Please come to the pool on Sundays and keep your skills alive. We charge £10 to use the pool if you have all of your own kit, £15 if you just need air or £20 per person for all equipment and pool time, jut give us some notice so we can arrange your equipment. We always go for breakfast in Lincoln after the pool, it is one of our weekly socials and catch up, please come along even if you haven’t been diving a lot of members do just that. We will be at the Bishop Grot refectory at 10am on pool Sundays. Please keep up with us on Facebook & Twitter, we post all of our trips, events and news on here rather than bombarding you with emails. Please visit these pages and like/follow to keep up with all things Stellar. Once you dive with us we will send you an invitation to our Stellar Divers Club page on Facebook, please accept this and then enjoy the benefits.